If you are a small business owner, it’s inevitable that at some point you may encounter a client or vendor who breaches a contract with you. If you are preparing to sue someone for a breach of contract, you may have an option between equitable and/or legal remedies. Legal remedies are ones that allow the party not in breach to recover money, whereas equitable remedies involve resolution through non-monetary solutions. Equitable remedies are actions rather than a financial award. They are often granted when monetary compensation or other legal remedies do not provide an adequate resolution. The court may require that legal damages must be unavailable before a judge will award equitable relief. In other cases, the judge may award equitable relief if it’s difficult to calculate an actual amount of damages. Specific Performance — Specific performance is a court order that requires the breaching party to perform their part of the contract according to the original terms. This may be something like completing work or delivering goods that were already paid for. Contract Reformation — The court orders the original contract be rewritten to reflect the actual intentions of each party in more detail. This requires that the original contract be a valid one in existence, otherwise there would be nothing that requires rewriting. Contract Rescission — The original contract that was breached is now cancelled or rescinded. The parties may write a new contract that better details the requirements of both parties. Injunction — The judge can issue an injunction that requires one party to stop doing something specific because it is causing irreparable harm to the other party and monetary damages cannot replace or repair the issue. Constructive Trust — When a party wrongfully obtains the other party’s property and used it to increase the value of his or her own property. 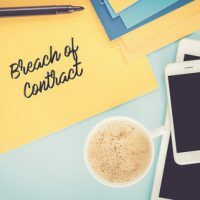 In a breach of contract case, legal remedies can take several forms in the way of monetary compensation. These are compensation for damages sustained as a result of the contract breach. In addition, the court may issue reimbursement for various items like out-of-pocket costs associated with the breach, or in limited situations, a judge may award punitive damages to ensure the defendant ‘learns’ from their behavior. For example, if you entered into a contract for 100 hours of work, but the client cancels during the course of the contract, then you have a breach of contract case for the income you lost by the cancellation. If you hire an agency to complete a project within a certain time frame and lose out on $5,000 because they didn’t complete their deliverables, you can sue for breach of contract. If you run a business, it’s important to have a Washington, DC business attorney who can provide advice and handle legal matters as they arise, including a breach of contract. Tobin O’Connor & Ewing has two decades of experience protecting the rights and interests of businesses in Washington DC. Contact us at 202-362-5900 to schedule a consultation.